America alone produces about 2,000 metric tons of nuclear waste annually and our best solution for disposing of it: bury it deep in the Earth. However, a pair of MIT scientists believe they've found not only a better way of eliminating nuclear waste but recycling the deadly detritus into enough clean electricity to power the entire world until 2083. Win, meet win. The conventional nuclear power method involves inserting radioactive rods into a reactor core where their fissionable material is converted into energy. Problem is, it's not particularly efficient. Over the four years or so that a rod will remain in use, only about three percent of its available nuclear material is expended, leaving 97 percent as "waste." And since nobody seems particularly willing to just fling it into the Sun, this waste must be disposed of in a nuclear repository site like Yucca Mountain, Nevada. Over the past forty years or so, the US has generated 67,500 metric tons of the stuff—enough to cover a football field with spent fuel rods to a depth of seven yards. But what if there were a way to recycle the waste and recapture the remaining energy? There is. Molten salt reactors are nuclear reactors which use a molten fluoride salt mixture as the primary coolant. These salts have proven to be far superior heat sinks than the helium used in light-water reactors, which greatly reduces the need for supplementary cooling. 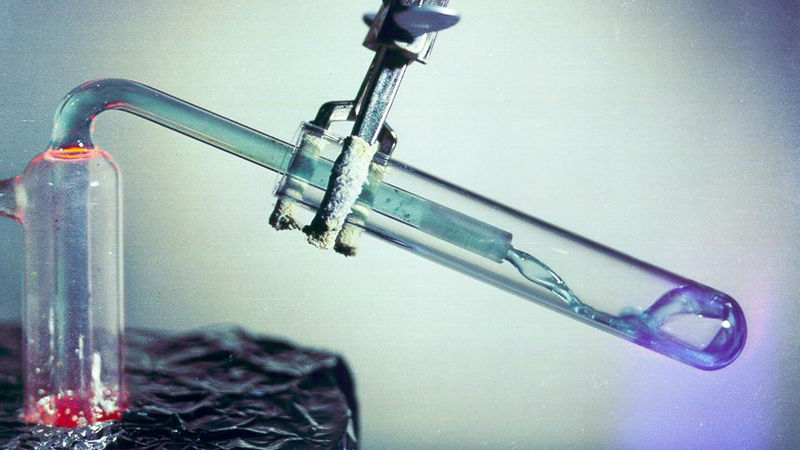 The nuclear fuel (uranium tetrafluoride) can also be dissolved directly into the coolant as well. When the fluid is inserted into a graphite core, the mix goes critical and drives a turbine to generate electricity. Unlike conventional light-water reactors, an MSR operates at very high temperatures to achieve thermodynamic efficiency but remain at atmospheric pressure to reduce mechanical stress on the system. The US military has been experimenting with MSRs since the mid '50s, producing both the Aircraft Reactor Experiment in 1954 and the Molten-Salt Reactor Experiment (MSRE) of 1965 conducted at Oak Ridge National Labs. The MSRE produced 7.4 MWth from epithermal thorium molten salts at 650 degrees C—enough to easily power a closed-cycle gas turbine while minimizing the amount of nuclear waste remaining. However, since MSR systems tend to take up more floor space than light-water reactors, the military opted for the latter when installing nuclear power in its subs and ships. Designed by Transatomic co-founders and former MIT researchers Leslie Dewan and Mark Massie, the Waste Annihilating Molten Salt Reactor (WAMSR) updates the technology utilized in the original Oak Ridge experiment. However, the new system is fuel-agnostic and can run on either the uranium or thorium leftovers from light-water reactors. According to Transatomic's website, their MSR is incredibly efficient—capable of utilizing as much as 98 percent of the remaining fuel's energy (though even a rate of just 50 percent would be a huge improvement)—since fuel suspended in a liquid medium can remain in a reactor for far longer than as a rod, allowing more of the fuel to be used. What's more, reusing this waste as a fuel source would reduce their radioactive lifetimes from hundreds of thousands of years to just hundreds. The Tansatomic system is also reputedly very user friendly thanks to a pair of idiot-proof safety features. The design of the MSR itself avoids many potential issues by keeping the pressure of the reaction low, this allows the fuel mixture to expand as it heats and self-regulate the fission reaction. If the system gets too hot, the mix will expand far enough to fall below criticality and automatically stop the nuclear reaction. The system also features a freeze-plug, an actively-cooled barrier that leads to a fortified, underground storage vault for the fuel mix. If there's a major power interruption, the active-cooling maintaining the barrier stops, the barrier melts, and the molten salt mix drains into the vault for safe storage until systems can be restored. The company claims that each reactor will be capable of generating 500 megawatts of power at a price of $1.5 billion apiece. That may sound like a lot but realize Westinghouse's new AP1000 light-water reactor only produces double that output and costs a cool $7 billion. What's more, these reactors are expected to be small enough to be constructed at a factory and shipped whole to the installation site where they can start chewing through the $7.1 trillion worth of untapped electricity sitting in our nuclear stockpiles.